Today's post features the only other miracle performed by Jesus (other than His resurrection) that we find in all four Gospels of the New Testament - the feeding of the 5,000. John 6 as a whole features the different ways the Lord Jesus Christ provides for His people. As we will see in this particular miracle of the feeding of the 5,000, Jesus Christ provides physical needs. Later on in John 6:16-21 we find Jesus performing the majestic miracle of walking on the water and calming His disciples' fears - hence showing Him to provide for emotional needs. Then the remaining bulk of John 6:22-71 details the marvelous revelation of Jesus as the bread of life as the Provider of spiritual life and salvation. As we consider the feeding of the 5,000 in John 6:1-14, the event occurs at least 6 months after the close of John 5. Per the other three Gospels, Jesus had commissioned the twelve disciples to go throughout the Galilean country-side to preach the Kingdom of God and perform miracles (see Luke 9:1-11 for example). As the disciples were out performing their first assignment, Jesus Himself continued teaching parables and performing other miracles. It was upon the return of the disciples from their first tour that we find ourselves leading up to this greatest of Jesus' mass miracles: the feeding of the 5,000. Now one would think that after all the disciples has done and witnessed through the power delegated to them by Jesus, there would be no need for them to be taught a lesson on how He provides. Yet, that lesson was needful. You and I have short memories when it comes to God's provision. The Lord will come through in major way and we will rejoice for a little while, only to come to within a week's time starting to wonder about God's provision. The point of this miracle is to set the stage for what will be a major theme in John 6. As is often the case, Jesus begins in the physical realm whenever He desires to bring His disciples to grow in their understanding of a major spiritual truth. His ability to provide not only physical and emotional needs but also spiritual needs will be the ultimate progression to which the feeding of the 5,000 points. So as we think on how Jesus Christ is the glorious provider, what can we glean from this miracle in John 6:1-15? The opening verses of today's post sets the stage for this miracle. A great need has arisen. 5,000 men plus possible families have been following the Lord Jesus through the country-side. John 6:5 notes Jesus lifting up His eyes to behold the crowd. Mark 6:34 adds the explanatory comment that Jesus saw the crowds as a flock of sheep without a shepherd. Their bellies were empty. Yet there was the more profound need of the emptiness of their souls that only Jesus could fulfill. In John 6:1-9 we see indications of how desperate and great the need was at this time. Philip, one of Jesus' disciples, notes it would take the equivalency of 8 months of wages to feed the crowd. Another disciple, Andrew, points out that the only provisions they have on hand is a small lad's lunch of five barley loaves (likely 5 small flat-bread crackers) and two fish (little pickle fish, a common food). The need in the physical far outstripped whatever money or resources the disciples had. John 6:6 tells us that Jesus knew this the whole time. Evidently He was testing them. We often find God testing His people for the sake of the people understanding how much they truly trust Him. 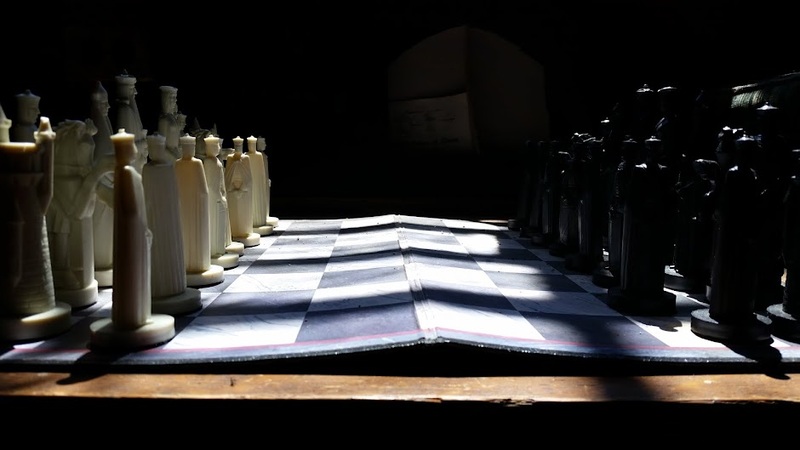 The tests are not designed for failure, but to equip for the sake of eventual success. Testing by God aims not to destroy faith, but build it, examine it and improve upon it by the means of strengthening grace which He gives (namely His Word, prayer and time with God's people). In such tests, the question is: will we rely upon God and His word in faith or trust instead in our own opinions, flesh and observations (see for instance 2 Chronicles 32:31)? The greatness of the need is pressed in upon these disciples and us as readers. Only when we are made aware of the desperation of the need will we be prompted to seek out a greater provision. Only Jesus can be the Great Provision. John 6:10-11 states - "Jesus said, 'Have the people sit down.' Now there was much grass in the place. So the men sat down, in number about five thousand. 11 Jesus then took the loaves, and having given thanks, He distributed to those who were seated; likewise also of the fish as much as they wanted." The word Jesus uses for "sit" in these verses has to do with rest and refreshment. 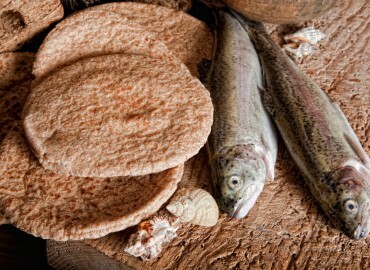 Most commentators point out that Jesus' multiplication of the loaves and the fish echoes the miracle done by the Old Testament prophet Elisha in 2 Kings 4:42-44. In 2 Kings 4:42-44 we read - "Now a man came from Baal-shalishah, and brought the man of God bread of the first fruits, twenty loaves of barley and fresh ears of grain in his sack. And he said, “Give them to the people that they may eat.” 43 His attendant said, “What, will I set this before a hundred men?” But he said, “Give them to the people that they may eat, for thus says the Lord, ‘They shall eat and have some left over.’” 44 So he set it before them, and they ate and had some left over, according to the word of the Lord." In that Old Testament miracle, God worked through Elisha to save the lives of the people from some poisoned stew. The people were hungry, and so a man brought 20 loaves of bread, Elisha blessed the bread and it was enough to feed 100 of the people. John 6:13-14 states - So they gathered them up, and filled twelve baskets with fragments from the five barley loaves which were left over by those who had eaten. 14 Therefore when the people saw the sign which He had performed, they said, “This is truly the Prophet who is to come into the world.” The people perceived that Jesus was perhaps (in their mind "perhaps") the fulfillment of Moses' prophecy in Deuteronomy 18:18 "I will raise up a prophet from among their countrymen like you, and I will put My words in his mouth, and he shall speak to them all that I command him." Indeed, Jesus was the fulfillment of that scripture, however, the people never went beyond that perception. Jesus was the ultimate prophet, but He was so much more. In John 6:15 we come to understand that the people wanted to take Jesus by force and make Him their King. As later verses in John 6 indicate, the people saw a free meal ticket with Jesus and a possible King who could overthrow the Roman tyranny of the time. Jesus of course did not come to bring in that type of a kingdom. Oftentimes what prevents us from seeing the glorious provider, Jesus Christ, are two things: misplaced expectations and too-low of expectations. To say Jesus was "the prophet" was remarkable, however, if that is as far as we ever go, we end up having way too low a view of Jesus. Sometimes we have a little view of Jesus, as well as misplaced expectations. We think He will do one thing, and when it ends up that the Lord provides in a different way than we expected, we accuse God of all sorts of things. Such attitudes prevent us from seeing Jesus for who He really is - the Glorious provider. As commentator R.C Sproul notes in his commentary on John: "He is our King, who gives us all that we need and more."